Trends come and go, but these timeless prints will never go out of style. On today’s episode, we show you how to wear these classic prints like a fashionista. HOW TO ACCESSORIZE BANKER STRIPES? Whether you’re into fashion or finance, banker stripes are the new style staple! Break the monotony of long stripes with layered chains and stackable wavy design gold bangles to make your look more attractive. 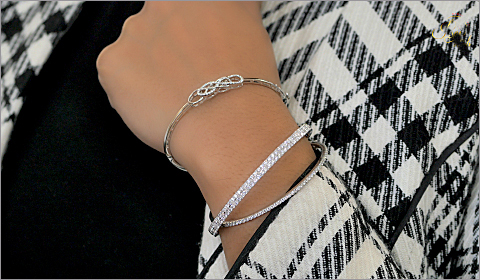 When wearing plaids, wear loud bold pieces like this large link pattern necklace with sparkling diamonds and gather all your diamond bangle bracelets & stack them up. Complete this look with a multi band ring. HOW TO ACCESSORIZE POLKA DOTS? Enjoy playful polka dots. Match this look with layered multi-tone beads chain necklace, beaded bangle bracelet and matching drop earrings. Just like polka dots keep everything round. No matter what prints you choose this season, wear them with confidence. Share your fall fashion with us using the #jewelryscoop, any you may win a chance to be featured on the next episode.